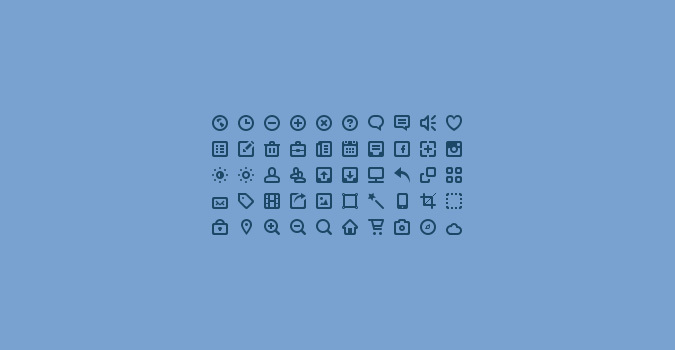 Today’s freebie is an awesome contribution from Swedish designer Victor Erixon – a set of 50 mini icons. Victor smashed it, these icons are not only pixel perfect, but have a ton of character. After downloading the set, go check out more of Victor’s work over on Dribbble. Perhaps give him a wave on Twitter too. Really great set of icons. Awesome colletion, but awful background. Looks like selected text! excellent, perfect for a ecommerce project i’m working on now. Thank you. Lovely, Thank you my good sir. wow!! this awesome.. every icon like Orman Clark said has tons of character in it..
if iMac/pc icon had a smaller “chin” it would have been better. – and — much appreciated. Fantastic! thank you so much~! Those icons are the cutest free icons I’ve ever seen. Good job and thanks for sharing. Love this mini icon! thanks a lot! Thanks for these icons. Really slick! awesome! Very useful for me. Thanks for shaing. i love you guys… seriously. Useful resource, thanks a lot! Awesome collection! I will forward this post to my developers. Thanks for sharing.